Mix all Port Wine Marinade ingredients. Place pork in shallow glass or plastic dish. Using meat injector, fill injector container to 1-ounce line. Inject marinade into pork every 1 to 2 inches, pushing plunger down slowly. Refill container and continue to inject marinade until marinade is used. Cover and refrigerate 1 hour. 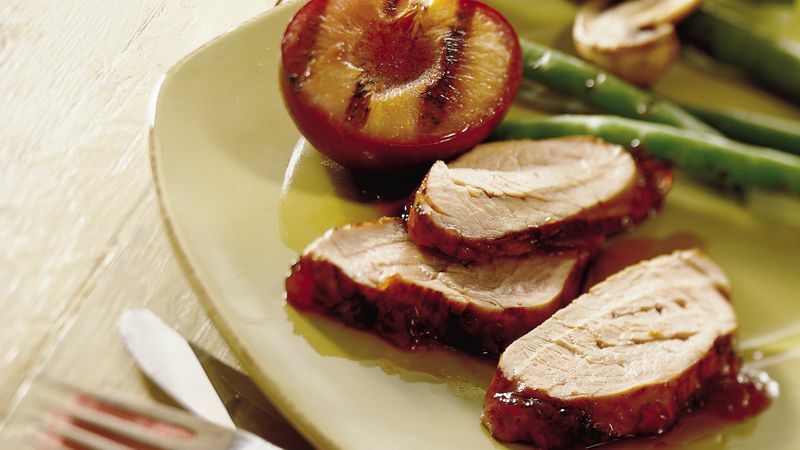 Cut pork into slices; serve with plums. You can use apple juice for the port wine. If you don't have an injector, pour the marinade over the pork in a shallow glass dish; cover and refrigerate 1 hour.